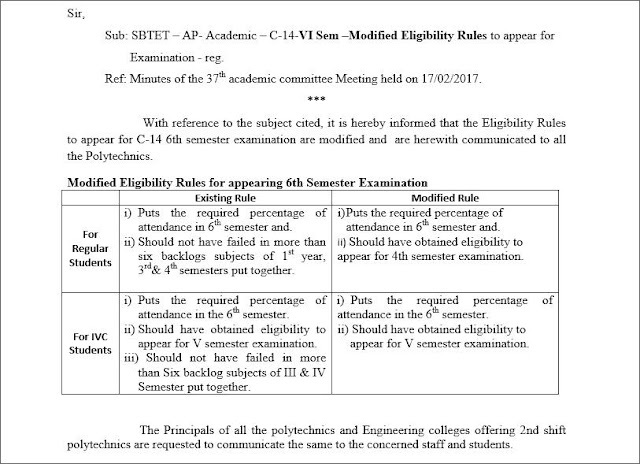 Sub: SBTET – AP- Academic – C-14-VI Sem –Modified Eligibility Rules to appear for Examination - reg. Ref: Minutes of the 37th academic committee Meeting held on 17/02/2017. 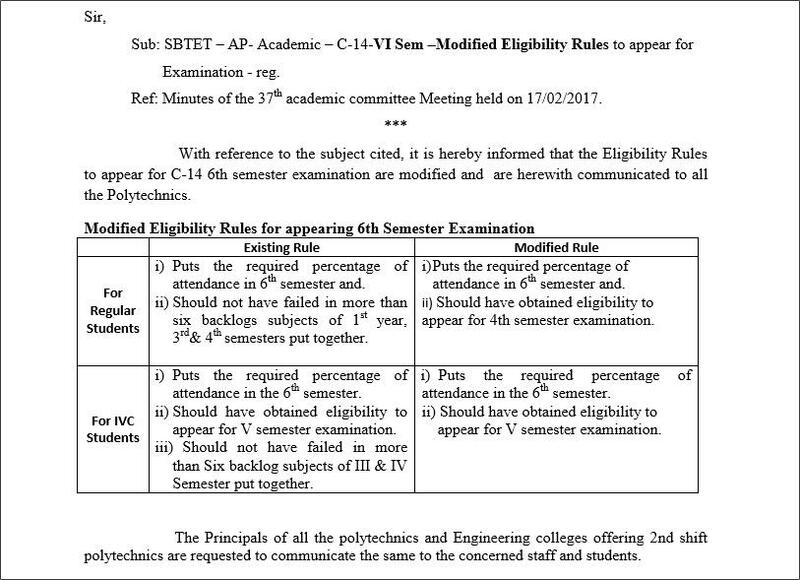 *** With reference to the subject cited, it is hereby informed that the Eligibility Rules to appear for C-14 6th semester examination are modified and are herewith communicated to all the Polytechnics. i) Puts the required percentage of attendance in 6th semester and. ii) Should not have failed in more than six backlogs subjects of 1st year, 3rd& 4th semesters put together. ii) Should have obtained eligibility to appear for 4th semester examination. i) Puts the required percentage of attendance in the 6th semester. ii) Should have obtained eligibility to appear for V semester examination. iii) Should not have failed in more than Six backlog subjects of III & IV Semester put together. The Principals of all the polytechnics and Engineering colleges offering 2nd shift polytechnics are requested to communicate the same to the concerned staff and students.